Any product claiming “extra virgin coconut oil” is misleading, as there is no difference between virgin and extra virgin coconut oil like there is with olive oil. Any product claiming “extra virgin coconut oil” is misleading, as there is no difference between virgin and extra virgin coconut oil like there is with olive oil. Here we will review the traditional way coconut oil was made and the different ways it is currently made for mass production. Hydrogenated oils are oils with trans-fatty acids that have been shown to raise cholesterol levels. One should always avoid hydrogenated oils from any and all sources. All refined coconut oil eliminates the taste and smell of coconut which is preferred in some recipes but not all refined coconut oil is RBD or hydrogenated. Tropical Traditions has a refined coconut oil that is processed the “old” way by what is called “physical refining.” This is a steam deodorizing process. They have two types of high quality refined coconut oils. Certified Organic and Non-certified refined Expeller-Pressed Coconut oil. Both are not hydrogenated, have no trans fatty acids, do not use solvent extracts and are good quality food-grade coconut oils. So apparently you have to research the companies you are buying from to find out just how they are refined. Whole Foods Market carries organic expeller-pressed refined Coconut Oil (see the photo above) and organic expeller-pressed unrefined virgin coconut oil. 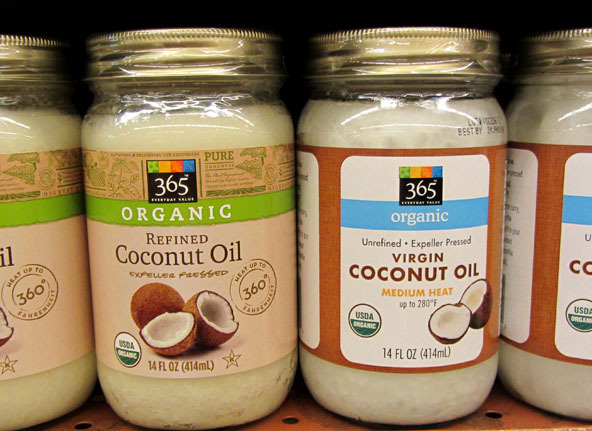 Note that the refined coconut oil is labeled for higher temperatures up to 360 degrees (average baking temp is 350) and the unrefined virgin oil is to be used only up to 280 degrees. The Asian and Pacific Coconut Community, an intergovernmental organization comprised of 17 different countries who supply 90% of coconut product has provided APCC Standards for Virgin Coconut Oil which states: Virgin coconut oil is obtained from the fresh and mature kernel of coconut by mechanical or natural means with or without the application of heat, which does not lead to alteration of the oil. Tropical Traditions was the first company to publish standards for the use of “Virgin Coconut Oil”. What they published provides even more details. Quick drying of fresh coconut meat which is then used to press out the oil. Using this method, the coconut meat is quick dried, and the oil is then pressed out via mechanical means. This is the most common type of “Virgin” or “Extra Virgin” coconut oil sold in the market today that you will find in stores. It is mass-produced. Tropical Traditions sell this method as their Green Label Virgin Coconut Oil. If you would like to make this version yourself at home, see recipe for Homemade Coconut Oil made with a high end kitchen appliance. With this method the oil is extracted from fresh coconut meat without drying first. “Coconut milk” is expressed first by pressing. The oil is then further separated from the water. Methods which can be used to separate the oil from the water include boiling, fermentation, refrigeration, enzymes and mechanical centrifuge. Tropical Traditions sell this method as their Gold Label Virgin Coconut Oil. Shilhavy says, “Fermentation” here is defined as the natural separation of the coconut oil from water using gravity. No machine or other substances are used in the extraction. First, coconut milk is expressed from the freshly harvested coconuts by using the pure water that is present inside the coconuts. The coconut milk is then allowed to sit for approximately half a day. During this time, the heavier water separates from the oil by sinking to the bottom, while the lighter coconut solids float to the top (curds). In between the coconut solids and the water is a crystal clear coconut oil that is completely unrefined. The oil is then slightly heated (less than boiling temperatures) for a short time (5 -15 minutes depending on air temperatures) to remove any remaining moisture and increase antioxidant levels, and then filtered. The result is a clear coconut oil that retains the distinct scent and taste of coconuts. This is a traditional method of coconut oil extraction that has been used in the Philippines for hundreds, if not thousands of years. If you would like to make this traditional highest anti-oxidant version yourself at home, see recipe for Homemade Traditional Coconut Oil. It’s not just for stir-frying and baking. See this article: 15 ways I use Coconut Oil Every Day for more ways to benefit from coconut oil.